The Illusionist is an act of cinematic reincarnation. It is based on a screenplay originally written by Jacques Tati, who died in 1982, but in Sylvain Chomet's film, the French artist takes centre stage once again in animated form. It feels like a Tati film in so many respects; not only because of the unmistakable figure of the man himself, but because of the complex soundtrack of mostly incomprehensible chatter, the layering of sight gags into both the background and foreground of the action, and the main protagonist's befuddlement at the technologies of the modern age. 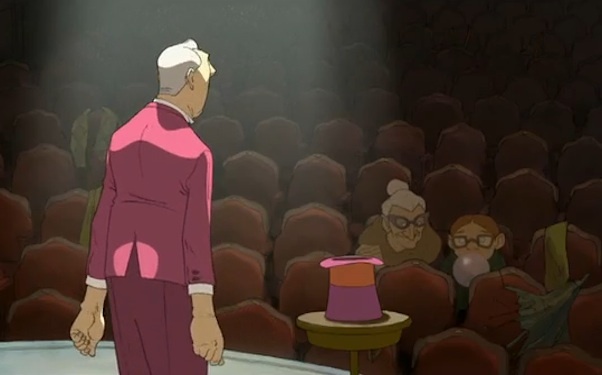 The Illusionist also bears the distinctive mark of Chomet, however, with the animator using old-fashioned techniques to find moments of great beauty in this surprisingly melancholy tale. The core of sadness that lies at the heart of The Illusionist was the reason that Tati decided against filming his screenplay in the early 1960's and decided instead to focus Playtime, the epic 1967 film that would cause irreparable damage to his reputation. 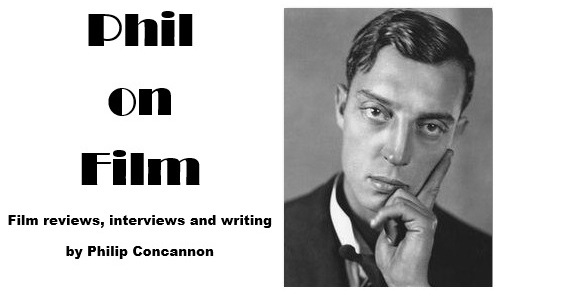 Who knows how his career would have developed if had instead proceeded with this more intimate and personal tale? In The Illusionist, the central character of Tatischeff (Tati's real name) is an ageing vaudeville conjurer struggling to make ends meet in the music halls of Paris at the end of the 1950's. He travels to a grey and wet London to see if he can revitalise his career there, but he discovers his act is even more irrelevant in a city swooning over the Beatles-like sensation of Billy Boy and the Britoons. Tatischeff waits patiently in the wings while they perform to a crowd of screaming teens, but by the time he has taken to the stage, the auditorium has emptied, leaving a few disinterested stragglers for him to perform to. Chomet's film is a lament for a lost era of entertainment, but Tatischeff does find an appreciative audience when he travels to Scotland, with a young girl being so enamoured with his trickery that she accompanies him to Edinburgh. She completely believes in the illusions he pulls off so effortlessly, but when she asks him to conjure a new dress or pair of shoes, she has no idea that he has to scrape together his pennies in order to do so, or that he has to find a series of demeaning jobs to make ends meet. It's hard out there for a variety act, and Chomet balances his film's humour with an air of despondency, occasionally straying from Tatischeff to focus on his suicidal and alcoholic fellow performers, all of whom are finding that their skills are suddenly no longer required. Frustratingly, however, The Illusionist stumbles somewhat between the two stalls of comedy and tragedy, and fails to leave a particularly lasting impression in both respects. The jokes are the kind that raise an occasional smile – Tatischeff's battles with his uncooperative rabbit are fun, and Chomet has a great gift for populating his film with instantly recognisable and memorable archetypes – but few of the film's comic set-pieces really stand out. Chomet's last film was the marvellous Belleville Rendez-Vous, which was ripe with invention and energy, but The Illusionist's more sombre tone sometimes drags, and the film peters out towards the climax, when the sense of loss and disappointment really should resonate. It's a gorgeous film to look at, though, with every shot benefitting from Chomet's eye for detail and atmosphere. After creating a vividly exaggerated world for Belleville Rendez-Vous, Chomet here produces some wonderfully evocative recreations of Paris, London and Edinburgh from a bygone age, and throughout the picture he proves himself to be a filmmaker in complete command of his art. The most affecting moments in The Illusionist occur when Chomet's brilliant animation succeeds in creating a sense of illusion and wonderment; turning feathers from an open pillowcase into an unlikely snowstorm, or making the shadow cast by pages in a book resemble the silhouette of a bird in flight. Perhaps the film's most remarkable scene comes when Tatischeff blunders into a cinema screening Mon oncle, and for a few surreal seconds, the real and imagined Tati gaze at each other through the dark. "Magicians do not exist," Tatischeff writes in one of the film's most downbeat moments, but anyone watching Chomet cast his spell will beg to differ.